Lately, I’ve become enamored with cultural experiences associated with Summer—namely, the spookiness of ghost stories and myths, where wild imaginations help whittle away the hot days. Re-watching Gravity Falls fuels my interest, and its “Summerween” episode is a perfect nightmare—with a twist. It’s difficult to talk about a single episode of Gravity Falls being a distinct example of that creepy Summer experience, when the series built its lore across an entire Summer adventure to encompass all of that and more. It was an adventure in approaching adulthood, and a chance at revisiting childhood fantasies, as told through its preteen twin protagonists, Dipper and Mabel Pines. Disney’s animated series, Gravity Falls, was set in a mysterious town full of secrets, time travel, inter-dimensional weirdness, supernatural occurrences, detective stories (!!! ), and a passing acknowledgement of aliens. It jammed packed so much of the other-worldly things of our own folklore and pop cultural phenomena but did so with its own unique identity—taking established ideas about lore, and turning them upside down. Gravity Falls was truly a special experience to grace our televisions, and I’m still acutely aware of the void its left since ending in February of this year. The show often used more comedy and pointed dialogue than legitimately terrifying creatures to tell its story. But that’s not to say Gravity Falls shied away from creating physical manifestations of ghouls and monsters to deliver scares. The show also relied on atmosphere to convey mystery, as seen through the animations of its eccentric town of Gravity Falls and its surrounding woods. When it really wanted to scare, it did so through measured and infrequent use of ideas of what we think of as ‘scary’. And so, when it finally unveiled something terrible, the impact was felt for being unexpected. “Summerween” is an example of the show employing both tricks, and satiated my fascination for all things creepy. It did this by cheating just a little bit—setting up the most wicked night of a year smack dab in the middle of Summer. 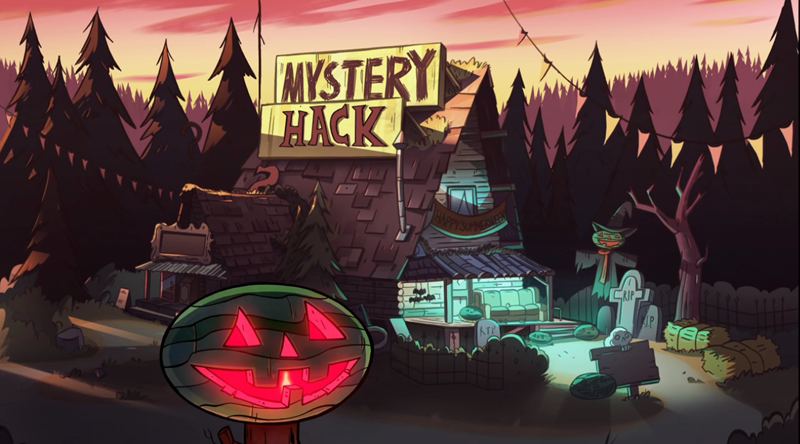 If the name didn’t give it away, the twelfth episode of Season 1 centered around Gravity Falls’ version of Halloween, which the town celebrates every year at the start of Summer on June 22. As the show captured one contained Summer seasonal adventure, the excuse for it to run a Halloween-inspired special was that the townsfolk loved Halloween so much that they devised a plan to celebrate it twice. Gravity Falls was a master at self-aware humor and in the episode, when Mabel remarks there is something strange about that reasoning, their friend, Soos, distracts from the obvious with promises of candy. Honestly, one of the best parts of Halloween is the candy, right? In my own Halloween experiences, tootsie rolls are the lowest forms of candy that any child could be bestowed with. Nature’s candy, raisins, are pretty bad too. In “Summerween,” the Pines twins are treated with reject candy, which is a staple of the holiday. Homework and Summer projects are a nightmare of Summer vacation, and Gravity Falls recognizes that Homework the Candy is the Summerween candy equivalent. All of the candy associated with Summerween are just as horrible and cheap knock-offs of the real stuff—fitting for the cheap knock-off that is Summerween itself, with its Watermelon Jack o’ Lanterns, called Jack o’ Melons. Even if Summerween presented as a cheap knock-off of the actual holiday, the town’s transformation was not. The sky darkened by 7 p.m., and the houses came alive with Halloween-grade fun in their welcoming glowing invitations to the town’s trick or treaters. Later, like any good Halloween night and horror movie, when the festivities came to a close, so did the encroaching darkness and spookiness that the real holiday delivers. The cheap candy was important for Gravity Falls to bring a good old-fashioned campfire (and campy) Summer story to life, while the Jack o’ Melons were reminders that even in Summer, malevolent mischief can find its way to scare up a dark Summer evening—especially if trouble is willfully invited. The episode’s foil is The Summerween Trickster—the stupid kind of myth that’s told to scare children who don’t embrace the holiday seriously. Dipper, Mabel, and their friends, Grenda and Candy, eventually discover that the Trickster is all too real but not before ignoring its existence when it first came knocking on their front door. And not before Dipper rejected a cherished part of his childhood that his twin desperately wanted and needed to hold on to. Gravity Falls is very much a show about growing up. In this episode, Dipper’s and Mabel’s Halloween tradition of using weaponized cuteness as twins to maximise their candy acquisition, is threatened to fall apart. The larger issue, of course, is that Dipper’s quest to fit in with older kids would have to happen at the cost of leaving his sister and their best friend relationship behind. While the continued exploration of Dipper’s and Mabel’s changing relationship is part of what makes “Summerween” really great, and on an emotional level, a poignant and bittersweet reality of entering adulthood—a prevalent theme of Gravity Falls, in general—the Summerween Trickster stood out to make the Summer episode terrifying on a physical level. The kids learn that its threats are credible after initially brushing off its shadowy appearance at the door as a man too old for dress up. Its mask didn’t appear as anything but adorable. Smiley face stickers are welcoming but in the right context can prove unsettling. Gravity Falls delivered when it revealed the full extent of The Summerween Trickster. And its first example of this is a direct, no nonsense one when it grabs a nearby child, bares its teeth and swallows the unsuspecting pirate clad Trick or Treater. Gravity Falls then furthers the lore of the episode through an ultimatum set forth by the Trickster. In it, the children have to gather 500 pieces of Summerween candy by the time the last light goes out from the jack o’ melons littering the town. It’s a request that effectively forces the kids to celebrate Summerween, and to recapture a lot of what it means to be a child through the simple act of participation. As a horror story, the fun task is partially clouded by their deadline and the pressure to succeed (Mabel, in keeping in character, remains optimistic). Groups not working together is probably high on the list of what not to do in a horror film, and Gravity Falls puts this idea into the strained relationship Dipper and Mabel find themselves in. Their bickering could cost them their lives, and it almost does when Dipper carelessly loses all of the group’s candy. As promised, the Trickster appears and that’s when Summerween gets even creepier. As if swallowing a child isn’t enough, the Trickster’s long limbs—used earlier on to show its ease at crawling off into the night—give it super speed. Its body grows additional ones and it becomes distorted, with its low toned voice both enticing and foreboding (or ‘“SUPER HOT!”’, according to Grenda, as recently revealed in the official publication of Gravity Falls’ Journal 3 book. She’s not wrong). It possesses movements of a nightmarish creature, akin to a spider, but more freakish—explainable as the mobility that only a monster can possess. It presumably gets destroyed but reforms its body into a misshapen mass of doom to give chase to the children and Soos. When the group is trapped and hides in the aisles of the Summerween mart, the Trickster hunts them. Despite its ridiculous mask, the intensity of that scene was real. One of the things that set Gravity Falls apart from the shows it pays tribute to such as Twin Peaks and The X-Files, is that many of its monsters are usually fully developed characters who aren’t actually scary, in the traditional sense, anyway. The Summerween Trickster falls somewhere in the middle, and even when the trickster is finally revealed to be a conglomeration of all the unwanted “loser” Summerween candy, it’s a silly moment that doesn’t completely erase its episode-long horrifying intent of chasing and desiring to eat the children. The episode resolves in a funny way as many Gravity Falls episodes do, with a twist upon a twist when Soos (who also got swallowed by the Trickster minutes before) eats his way through the monster’s stomach. If that’s not disturbing, especially when Soos bluntly recalls the implications of his actions during the final scene, then I don’t know what is. “Summerween” is a delightful spooky Summertime adventure for blending the story of a tangible threat of a campy monster lurking in the shadows, with that of a story of the natural and inevitable evolution of growing up. This mixing of supernatural tales to anchor and chronicle the Pines’ relationship is something Gravity Falls did well during its two season run. For bringing a distinct feeling of Halloween into Gravity Falls, “Summerween” lets Gravity Falls feel a little darker and even more traditional than usual—a rarity for the show that makes it all the more brilliant. More Cartoons. And More Summer Scares.